So this week was spent at the John Owen Today conference. It was good to meet people I had only made contact with over the internet in the past (e.g. Marty Foord, Mark Jones and John Tweeddale) and to make new contacts. This was the main benefit of the conference as not many of the papers were directly relevant to my thesis – I was unable to attend the most relevant paper (John Owen’s Gospel Offer: Well Meant or Not). The most thought provoking talk for me was the first of the conference by Prof VanAsslet on “COVENANT THEOLOGY AS RELATIONAL THEOLOGY: The Contributions of Johannes Cocceius and John Owen to A Living Reformed Theology”. The particular point I found interesting was his stress on the relationship between the denial of a distinction between the covenant of redemption and the covenant of grace and eternal justification. Essentially VanAsslet argued that a proper distinction between the covenant of redemption (the triune God’s eternal counsel) and the covenant of grace (the execution in time of this eternal counsel) helped prevent time (covenant of grace) being swallowed up in eternity (covenant of redemption) thus mitigating against eternal justification. VanAsslet noted historically if the covenant of grace is collapsed into the covenant of redemption there is the danger of eternal justification emerging (e.g. Gill). “The person called to this, is expressed thus, if any man, etc. which putteth it so to every hearer, as it it went round to every particular person, if thou, and thou, or thou etc … because where the Lord saith any man, without exception, who is he that can limit the same, where a person of whatsoever condition or qualification is found, that will accept of the offer according to the terms proposed?” (Revelation, Rept. Old Paths, 2000, 274). Right so the gospel is offered to everyone who hears preaching. But Mr Durham, are you really sure the gospel offer isn’t restricted to sensible sinners – I mean we would never offer the gospel to those most insensible of sinners, professed atheists, would we? Finally I found out this week that there is an unpublished manuscript sermon by Samuel Rutherford on Rev 3:20! I assume that Rutherford takes the same view of this verse as Durham i.e. it is an evangelistic appeal to unbelievers. In which case this sermon is hugely significant for my thesis and would, perhaps, depending on its length, be worth transcribing and including as an appendix to my thesis. I need to get up the the National Library of Scotland and read this sermon post haste! 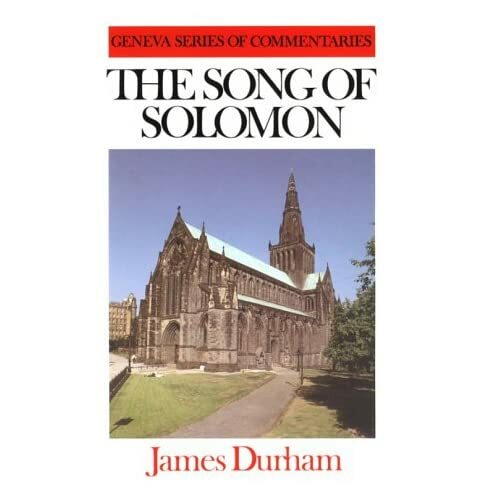 Prior to the reprinting of most of Durham’s corpus in the past few years the one work that was easily available was his commentary on the Song of Solomon. This was thanks to a reprint by the Banner of Truth in 1982. All of 10 years ago I got and devoured my copy and have been a Durham fan ever since. In a very real sense Durham’s commentary of the Song is responsible for the thesis I’m working on today! Now, what has Durham’s commentary on the Song got to do with the free offer? Honestly, not very much. I am posting on it here, not because it is related to the free offer, but because it gives valuable insight into mid 17th C Scottish hermeneutics and because I believe there is much to commend Durham’s approach to interpreting the Song. To start at the beginning, so to speak, I want to look briefly at the introductions by James Durham’s wife Margaret and by John Owen. Both are interesting. Margaret Durham’s essay shows her to have been a very capable theologian in her own right! She places Durham’s work in the context of a larger series of Scottish commentaries designed “for the benefit, not only of scholars (who have many large helps in other languages;) but also, yea, principally… [for] families, that can read… for their edification…” (p12). I assume, given the historic Presbyterian emphasis on a “learned ministry,” that she would place ministers in the “scholar” category who would at least at a minimum have Hebrew, Greek and Latin. The important point here is that Scottish theology was not formulated in isolation from the larger development of Reformed theology. The leading Scottish theologians had access to, and developed their theological outlook in interaction with, the great European, Medieval and Patristic works of theology – “large helps in other languages”. I foolishly passed up the chance to do Latin in my final year in school -what a mistake that was! John Owen’s introduction sheds light on the reputation Durham had among his contemporaries, as well as Owen’s own view of the Song. Owen was asked to write a foreword to the book but was initially reluctant because he “judged this labour altogether needless, on the account of that reputation, which the known piety and abilities of its author, have in the Church of God” (p19). Owen was obviously persuaded and goes on to commend Durham “… as one of good learning, sound judgement, and every way ‘a workman that needeth not to be ashamed'” (p19). Not a bad recommendation to have. Owen particularly esteems Durham’s distinction between types and allegories which I will discuss next week, DV. For Owen, the Song of Solomon is “totally sublime, spiritual, and mystical; and the manner of its handling universally allegorical” (p19). In Owen’s opinion, along with the generality of expositors in his day, “the Song is one holy declaration of that mystical spiritual communion, that is between the great Bridegroom and his Spouse, between the Lord Jesus Christ and his church, and every believing soul that belongs thereunto” (p21). While Owen would not bind future expositors to the detail of Durham’s commentary he notes, “it will be hard for any to discover, either defect in judgement, or untruth in affection, or the omission or neglect of any rule, means or advantages that might, or ought to be used in enquiry after the mind of God, in this work, or a want of perspicuity, and plainness in the discovery, or expression of his conceptions upon it” (p22) – high praise indeed! With such a fulsome commendation from Owen, Durham’s interpretation of the Song is surely worth studying. I will post on Durham’s view of the Song and his reasons for interpreting it that way next week, DV.